With her Stradivarius violin, she performed with veracity and a varied blend of colour and emotion. 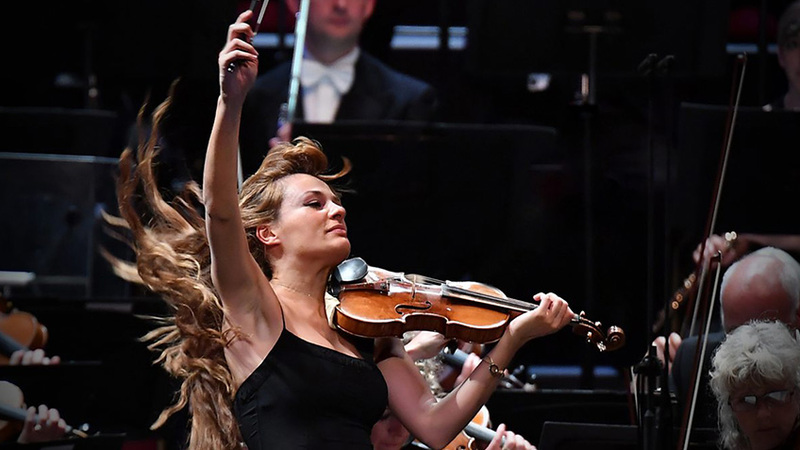 From start to finish, she uncovered the effort, grace and sensitivity required for any violinist attempting to perform the work, and it definitely didn’t seem straightforward. Shostakovich, himself, didn’t compose the concerto to entertain. Rather his aim was to educate and give a lesson, and a historical message, of the political upheaval in his own country in 1947. Stalin was determined to assert power into every aspect of life in the Soviet Union, including the arts, and for the most part, listeners sense the unsettling feelings; the sadness and internal violence Shostakovich faced, within the score’s writing. Naturally, the work was unheard of until Stalin died, a couple of years after Shostakovich had finished it. The BBC NOW first opened the concert with the rarely performed obligatory composition of Shostakovich’s ‘October’ written in 1967 to commemorate the 50th anniversary of the Russian Revolution. Designed to be a symphonic poem, it is fascinating to know that the work was neglected and is hardly performed. Sections of the work are reminiscent of his Symphony No. 10. Whether there are secret meanings here are unknown. For the BBC Proms, this was the first time it was performed, yet the BBC NOW and Søndergård, felt slightly held back. The opening horns and fanfares could have been louder and the strings could have been more sinister, in sound, however, this was a neatly done and kept at a safe range. I just hope I can hear October again in another concert, not hidden away as it has been for the past fifty years. The final piece, that took up the second half of the evening, was Sibelius’s Symphony No. 2 and Søndergård seemed much more at home. As he had performed many of Sibelius’s symphonies, the conductor didn’t shy away from taking some liberties. When a revolution is what you hear in Shostakovich’s work, it is the sound of Finland that captures the work of Sibelius, in its entirety. Think about the mountains, the landscape, and the pastoral images of the green. Søndergård instilled his passion for the work by staying true to the score, keeping the music soft, delightful and romantic. In the same light, the music came more naturally for the BBC NOW. It was pleasing to see them perform a piece they felt much more familiar with.